The second and third days, Marcus gave us hands on training on building tools for our own experiments. The primary vehicles for this were introductions to Arduino development and basic computer programming. We started out with very basic circuits that did things like dim an LED based on the resistance of a potentiometer, but by the end of the externship we had built our own (simplified) waveform generator and an infrared light sensor. Each project was a powerful demonstration of the utility (and ease!) of building tools for scientific exploration. Being at Reed, it is often easy to get lost in the theory of our sciences, so seeing our ideas materialize into tangible tools in only a couple of days was an empowering experience. To top that off, Sigenics even gifted us our very own Arduino module to bring back to Reed and keep developing the invaluable skills we learned in their lab. 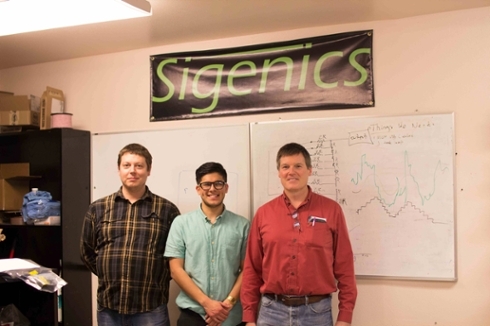 The time we spent at Sigenics was an invaluable investment to my life beyond Reed. As an aspiring Electrical Engineer, the externship provided a sneak peek into my future, full of insights and valuable information that simply does not exist within the classroom setting. I look forward to continuing my exploration of electronics with the tools that Sigenics provided me and can’t imagine a better way to have spent my time back home.